and I want to check for multivariate normality of the first four columns ("Sepal.Length" "Sepal.Width" "Petal.Length" "Petal.Width") using the rQ statistic. How can one do this? I understand how to check if each of the marginals are normal (for example, ppcc function in R will do this), but I dont see how I can use rQ to check for multivariate normality. Supposing one of the ppcc calls fails marginal normality, then we can reject multivariate normality; but even if all four of the marginals are normal (checked by rQ) this does not imply multivariate normality. I think it's also important to flesh out the underlying statistical motivation for the various multivariate tests already mentioned - beyond just how to carry it out in a statistical software. Mardia's test of multivariate normality is based on multivariate measures of skewness and kurtosis and compares these with theoretical reference distributions (much like how the Jarque-Bera test assesses univariate normality). Generally, tests of the skewness and kurtosis are performed separately but there are joint tests too. There is a variety of tests implemented: Mardia’s test, Henze-Zirkler’s test, Royston’s test, Doornik-Hansen’s test and the E-statistic test. Not the answer you're looking for? Browse other questions tagged multivariate-normal or ask your own question. Proof for linear combination of multivariate normal X? 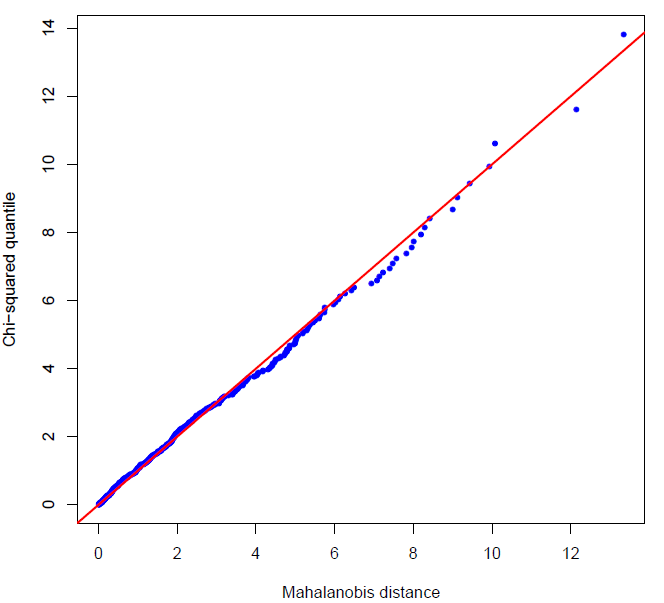 Does p value below 0.05 in mvShapiro.Test mean multivariate normality or not? Is this a legitimate method to test for multivariate normality? Why do I need multivariate normality tests?